It happens pretty often to me Lisa; usually when I'm tremouring and the Great Scot isn't in sight. It freaks me out, frankly. Ummm no. That would totally unnerve me! Wow! I think I'd totally lose that game. That is SO funny! I swear, you have the coolest experiences!! tijden veranderen ook het speelgoed. That is so cool! However, this was more proof that random old men can't be trusted! The stranger hugging would have flipped me out too! I had a massage last week while on vacation; for the life of me, I could not relax my brain...it's so hard to stop the brain activity!!! HA HA ---I have never been hugged by a stranger ---but I hugged a stranger once thinking he was someone else. Oh My--was I ever embarrassed!!!! Oh I like this! Our Science Museum is really an imagination hot spot too! Great fun you all must have had. I can't remember being hugged by a stranger, but I've had strangers start conversations with me thinking I'm someone else. I think a couple of time I have been hugged by a stranger... but not recently. Good grief!!! Well, he SAYS he thought you were a statue, but you are so pretty...What a fun game! I would love this. And I think it is so good for kids, to help them learn how to settle down. I don't think I have ever been hugged by a stranger! And I don't know if I would like it!! That game looks great and the boys look like they are working hard. 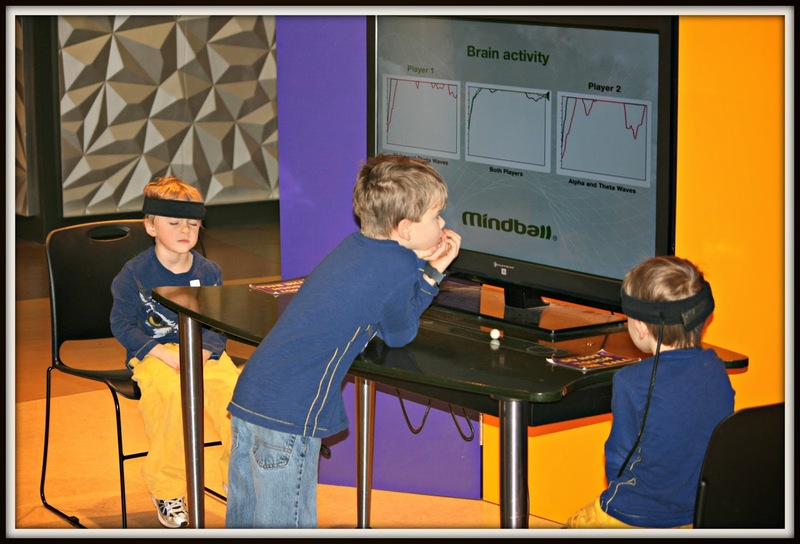 I've never heard of Mindball. Sounds like an interesting game. Not sure I'd win though because my mind is always racing with thoughts. The boy on the left looks really relaxed. This is a cool post showing how your children were doing this game. Now that's a cool game. I would have been so startled, too, LOL! My grandmother used to tell me that when I was little, I loved giving hugs, and would go up to other little kids my size and squeeze them so hard, we'd both topple over (which would end in the other kid in tears). So I guess I used to hug strangers. I was hugged by a woman in the checkout line at the grocery store. I didn't know her and then, in a very loud voice, she asked me why I didn't like her hug. I could have melted right into the floor. That game looks very interesting. I don't remember ever being hugged by a random stranger...My brain waves would have gone a little batty. My son love the science museum too. Nope...never been hugged by strangers. Probably my side here it more conservative. An innocent simple hug may turn into front page news. Just like the receive K-Pop group that came here recently. ha what a funny story! Partly I find it creepy. Partly I think it's nice. People need more hugs. I just wish it was more common, so the freak factor wasn't there. It's too bad you lost your round. Oh my goodness, that's quite a story! I would have jumped, too!